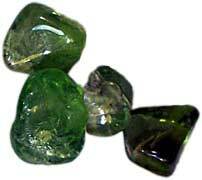 Gem quality peridot occurs on the property of Chudleigh Park, north of Hughenden. Chudleigh Park turnoff is about 140 klm north of Hughenden along the Kennedy Developmental Road; coming from the north about 17 klm from "The Lynd Road House". From the Chudleigh Park turnoff sign of the Kennedy Developmental Road travel west 5.5 klm to where the main track forks; take the left fork and go to the Homestead and seek the necessary permissions and information. Go back to the fork in the road and take the other Track which leads to the fossicking area. It is possible to stay at the Lynd Road House of in Hughenden and travel to the diggings each day. The preferred option is to camp at the diggings. To do this, campers must be self sufficient in all things including a first aid kit. See Conditions of General Permission for further details. The peridot diggings are located on the eastern slopes of the basaltic cone. The peridot occurs in the hills slope soils, deposits of sub angular fragments of varying colour from light yellowish-green through to deep green. Digging with hand tools and dry sieving to a depth of 40cm is the usual method. Water is not available on the diggings and streams in the area are generally dry. The fragments are covered in a brown dust like coating, which is difficult ot remove at the diggings, most people snip the end of a few sample pieces to identify the material, if colour is apparent the piece is kept. After a few pieces the shape is identified and all pieces of like angular shapes are kept and the pieces tumbled in a tumbling outfit to clean them up at a later date. Continued snipping may crack the piece and render it useless for faceting. The area known as Yowah is famous for its Precious Opal in Siliceous Ironstone nodules commonly known as Yowah Nuts. The Yowah Nuts are found in layers at depths up to 20 metres in decomposed sandstone. The main layer is located between the sandstone and underlying clays. The landowner of Chudleigh Park has "given permission" for fossicking and camping to continue at the Peridot locality.Permision is given only to holders of a Queensland Fossickers LicenceAll licensees must report to the manager at "Chudleigh Park" homestead on entry to notify presence and length of stay-maximum of 4 to 5 nights. Camping is restricted to the campsite on the eastern side of the Stawell River. Visitors need to be totally self sufficient, including adequate supplies of water. OTHER CONDITIONS RELATED TO STATION NEEDS MUST BE COMPLIED WITH; THE STATION MANAGER WILL INFORM FOSSICKERS OF THESE. A 4WD vehicle is recommended as the roadways and tracks can be very rough; this varies with the seasons and time of grading of the Kennedy Developmental Road-it's very had on Caravans and the like as corrugations can easily be in excess of 100mm deep-minor water wash outs can also be common along this road.